On the occasion of International Women’s Day, Emirates is highlighting the integral role played by its female employees through a special video which documents the breadth and diversity of the operational and technical roles performed by women in the Group. The video gives the audience a behind the scenes look at women employees from various Emirates Group business units, carrying out all key activities for the operation of flight EK 225 from Dubai to San Francisco. The Emirates A380 aircraft was piloted by Captain Patricia Bischoff from Canada and First Officer Rebecca Lougheed from the UK with cabin crew led by the purser Weronica Formela from Poland. In addition to the flight crew, an all-woman team worked on all ‘above wing’ and ‘below wing’ activities in the lead up to flight departure. This included women in roles spanning customer service in the airport such as the Passenger Duty Service Manager; ramp operations monitored by the Ramp Duty Controller and Ramp Operations Team Leader; technical services carried out by Licensed Aircraft Engineers and Technicians; and a myriad of other roles within the flight dispatch, aircraft appearance, crew operations, catering and security teams. In total, a team of over 75 women from more than 25 nationalities worked on the flight. This mirrors the overall diversity within the Emirates Group which employs staff from over 160 nationalities. The operational team for EK 225 also included Emirati women working in the Engineering, Flight Dispatch, Security and Cargo operations teams. 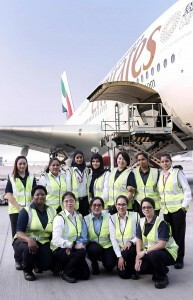 The Emirates Group employs women from over 150 nationalities. This includes close to 1,150 Emirati women who work in diverse functions across the business, and are represented in senior managerial and executive roles across the Group. Overall, female employees constitute over 40% of the workforce at Emirates with the majority of women working as cabin crew. Over 20% of all supervisorial and managerial roles within Emirates are occupied by women.